I knew exactly what I wanted to do with this stool when I saw it at an estate sale. Something simple, comfortable, and monochromatic. Actually, both the stool, and the rice sack are from the same sale. The stool was pretty sad, and everyone stepped over it. Poor thing. I applied multiple layers of paint, in various shades of grey, followed by a bit of distressing. The icky fabric was removed, and replaced with fresh padding, and a section of the rice sack. A forlorn stool, given another chance. Love the stool. Thanks for sharing. That turned out so cute! I love how fresh it is now. You were really able to see past its flaws when you got it. You saved her and now she is a beauty. What a great transformation. Beautiful. That stool is forlorn no more! The rice sack is perfect on it. Awesome stool. You did a fantastic job with the makeover! Stools are one of my favorite projects....with just the right paint job and fabric, voila, what a fantastic transformation! Yours is gorgeous. How cool! 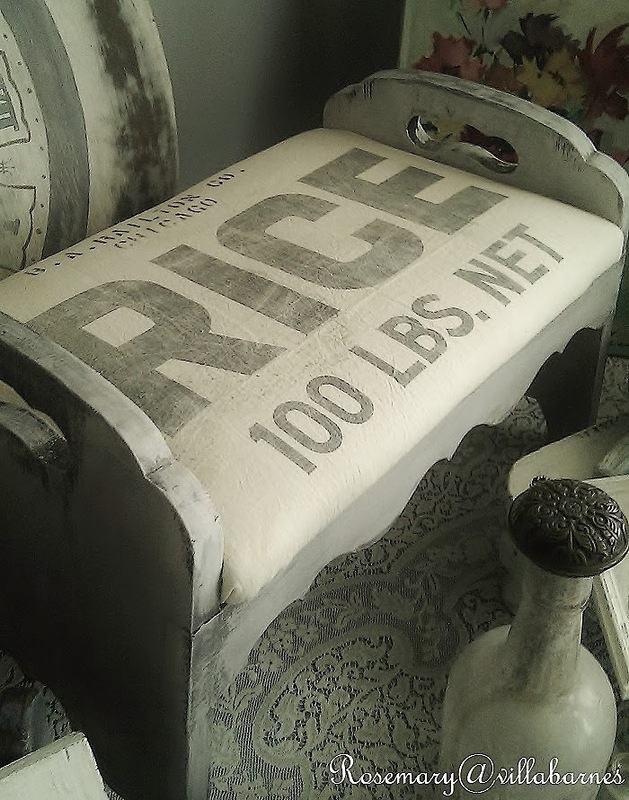 I love how the rice print fits on the stool seat, and the gray you chose is perfect. Now, I want a rice stool...wish you were closer. One of my favourtie things! I love how the sack perfectly echoes the lines of the stool. Really nice. 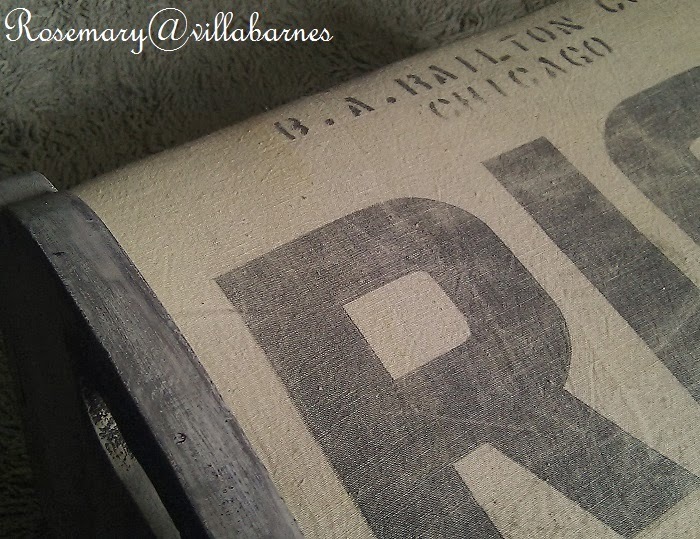 Love those layers of gray paint. The RICE fit perfectly for the seat. The stool is absolutely gorgeous. Beautiful job! Oh how I love thee! I can hardly count the ways lol. It's gorgeous Rosemary. 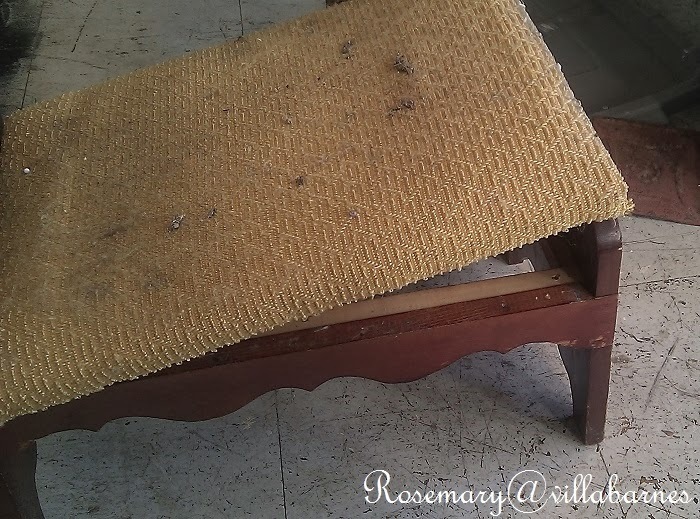 Love the stool Rosemary! 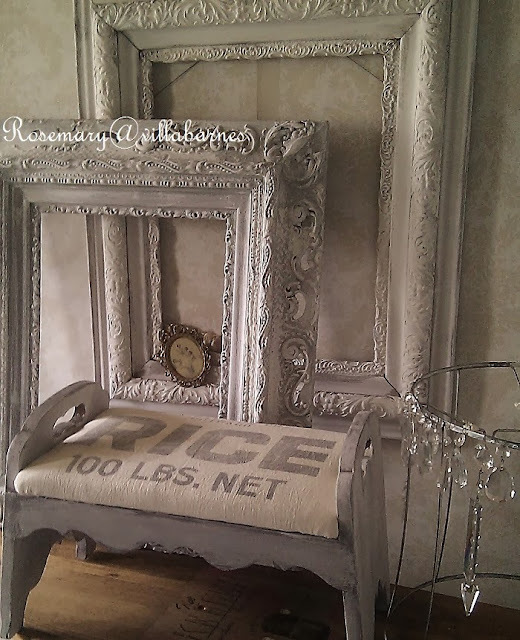 Love that you used gray paint and then distressed. I think the finish really plays well with the rice sack. You are always surprising me. I'm so happy you rescued this diamond in the rough...love the transformation. Wow! You sure do work your magic. The stool looks beautiful now. you have "vision" my dear Rosemary! all your creations are beautiful! Excuse me while I FALL IN LOVE.!! This is an adorable stool and if I can find a rice sack, I have a stool that is going to get the same treatment. I love yours....great job.